A couple weeks ago, I wrote about the unchartered investment waters that lie ahead. For the first time in over a decade, the Federal Reserve has taken the fed funds rate — currently at 2% to 2.25% — above the rate of inflation. That means you can park money in cash and keep up with the rate of inflation. The next major market move will arrive in the form of higher long-term interest rates or lower stock prices. Both of these events happened. Interest rates have skyrocketed, and the stock market has fallen sharply lower. Do You Think the Fed Can Pull This Off? To keep the greatest monetary experiment of all time going, the Fed needs to create a delicate balance between growth and inflation in order to keep the economy humming at a sustainable pace. The training wheels have finally come off. Now the Fed is giving little Junior a gentle shove, and we’ll see if he’s capable of riding a bike. Push him too soft by keeping interest rates low, and the lack of forward momentum leads to a collapse. Push him too hard with higher rates, and the neighbor’s hedge is at risk. In August, the bond market signaled that the Fed might not be successful in orchestrating the perfect push. This can be seen in the flattening yield curve, as the spread between the two-year note and the 10-year note narrowed sharply. In late August, the two-year/10-year spread stood at 19 basis points, a multi-decade low. Since then, the longer-dated bonds sold off, sending interest rates higher and ending the summer’s stock rally. 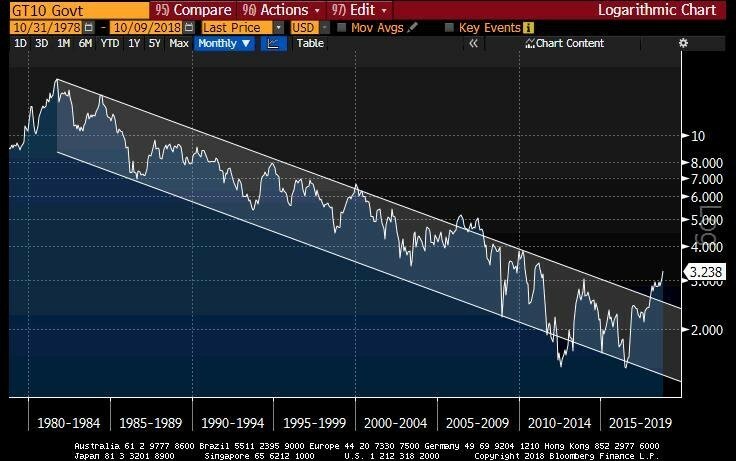 What’s even worse, we may be facing a generational reversal in interest rates. The S&P 500 Index, as measured by the SPDR S&P 500 ETF (NYSE: SPY), peaked on Sept 20 at $293.58, and then dropped 5.2% to $278.30 on October 10. Tech stocks, which benefit from lower interest rates, fared even worse than the S&P 500. The Nasdaq Composite Index, as measured by the Invesco QQQ ETF (Nasdaq: QQQ), peaked at $186.17 on October 1, and then plunged 7.8% to $171.73 on October 10. Stock market leaders have been taken out to pasture. The Facebook, Apple, Amazon, Microsoft, Netflix and Google complex has started to deteriorate. Only Apple and Microsoft are clinging on near their highs. But if you think the stock market is in a bad spot, take a look at the U.S. government bond market. The worst shellacking took place in the longer-dated maturities, which saw the biggest rise in yields in over a year. Remember, bond prices move inversely to yields. So if yields are going higher and you are long bonds, you are losing money! The 10-year U.S. Treasury note moved from 2.8% in late August to a recent high of 3.25%. The iShares 20+ Year Treasury Bond (Nasdaq: TLT), which tracks the prices of a basket of U.S. government bonds, has dropped 9% since late August. Volatility arrived like an unexpected hurricane. The CBOE Volatility Index (VIX), dormant for months, jumped almost 90% in the past week. On top of the bond market mess, investors are wary of what lies around the corner with a possible Democratic sweep at the polls next month. These are uncertain times. And after a 10-year run for stocks, investors would be wise to raise some cash. The good news is that you can now invest that cash in a two-year note and outperform current inflation expectations. « Previous Don’t Miss out on the Industrial Stock Boom!